What's New at Nail Art Gallery? If you’re a fan of our online community, Nail Art Gallery (nailartgallery.nailsmag.com), you’ll be happy to know that it is now easier than ever to share your nail art. Let us walk you through some of the modifications we’ve made so you can begin uploading and sharing ASAP. Hopefully by now you have been to our Nail Art Gallery site and become quite addicted. Simply go to nailartgallery.nailsmag.com and you can either browse photos without logging in, or log in for a fuller user experience. Read on for some cool new features and improvements we’ve made to the site. If you’re an iPhone user and have IOS6 or later installed, you can now upload photos directly from your phone. Open your browser to Nail Art Gallery and log in. 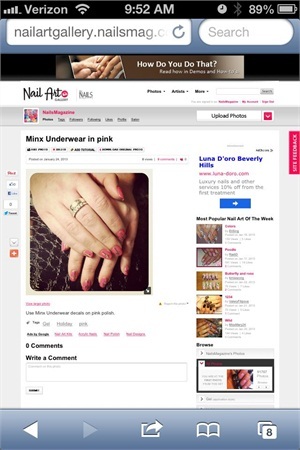 Nail Art Gallery no longer limits the amount of photos that can be posted to your profile. This means you have endless opportunities to share your nail creations and how they are made.